Discussed in its own page, see Escalation Service. To use, enter the user ID of the user you wish to become, and press Run. To return to yourself, log out, then log in again. You cannot su from a user having only administrative rights to a system administrator. Currently broken due to GRV-732. This tool will change the owner for one or more dashboards from one existing user to another (JRA-19780 and others). If the target user does not have permission to view it it’s shared globally Select the dashboards/filters to modify then hit the Preview button to see what will actually happen. This will change the resolution on all issues returned by a query you provide. Resolutions can often be wrong after an incorrect import, or after modifying the workflow, or if there has been problems in your workflow. Another common problem is when doing a jira→jira migration, which might create a Resolution called UNRESOLVED. This script will allow you to modify them all without tampering with the database or reindexing. To use it you’d create a filter that selects all issues with the bad resolution, then get the filter ID (from the URL), select the resolution you want to change it to or None, click Preview then Run. After this has been done you should delete the bad resolution value to prevent it being used inadvertently. If you choose to copy issues, all links on issues in the source project will be copied, with one exception. Intra-project links on the project will be reproduced on the respective issues in the copied project. For instance, if you are copying project A to project B, and in A issue A-1 depends on A2, then B-1 will depend on B2. Again, useful for seeding a project with sample issues for onboarding new teams. For each issue returned by a query, this will copy values from one custom field to another. This is useful if you want to convert the type of a custom field. Single to multi, eg single select to multi select, single user picker to multi user picker. Multi to single, however only the first value will be retained. Multi to text…​ the values are concatenated with a comma. If you are unsure try on a test instance first. This script is for importing multiple values into the options list for select, multiselect, radio, checkbox, or cascading select fields. The non-programming alternative is generally doing a dummy CSV import with each issue having a different value, then deleting the issues. From the dropdown, choose the correct field configuration, which is shown below its custom field. Enter the options with one on each line. This script will skip over already existing options, so it is safe to update options lists using this. You may well never have had a need for this, if so move on! This script applies to field config schemes for select, multiselect, radio, checkbox, or cascading select fields. Let’s say you have created a select list with various options and applied to two projects. After a time, one project wants to add/delete/deactivate one of the options, but the other project still requires it. Although you can create a new context and move one of the projects, this will lose the values for this field from its issues. Actually, they will display on the view screen, but when you come to edit the issue they will be lost. This script will duplicate the options for a field config scheme, associate with one or more of the projects and issue types from the first screen, then migrate all the issues' field values to the new Option objects. Start by selecting the field config scheme which you wish to split. Click next, and you will be shown a list of the current projects and issue types associated with. Choose one or more projects, then click Preview to see how many issues are affected, then Run. At this time, splitting just an issue type is not supported. The script registry lists all the ScriptRunner code you have used in your JIRA instance. The code here is type-checked. You are advised to use the Script Registry on your staging instance after upgrading, to validate that all the APIs you rely on are still present. This is a workflow function, but it is available from the admin menu as it allows you to test the configuration fully before you set it up in your workflow. See the documentation below for information on this built-in script. A utility for testing conditions that are used in various other of these scripts. See Simple scripted condition below for details. Two built-in scripts for the price of one. Clearing JIRA’s internal caches is useful if you have done something in the backend, such as modified one of the database tables. It fires a global clear cache event and will clear all caches that respond to that signal. Safe for production, the same thing happens when enabling/disabling plugins etc. You can clear the groovy internal caches if you are developing in groovy. Classes should be automatically reloaded when they are modified, and this works fine for workflow functions etc. However it can fail to reload dependent classes. If that’s the case you can clear all compiled classes using this. Expect a delay for the screen to refresh, as many classes need to be recompiled. This script lists the job runners and the job IDs that are scheduled in your instance. If the job has parameters then these are shown in the box below. No parameters are required for this script, just click Run. Simply shows the last lines of the desired server log. This is useful for quickly checking the log files without having to connect to your server and find the log file, especially if you haven’t been given access to the server. Enter a JQL query, if the current issue would be returned by the query, the condition is allowed. This is less flexible but possibly simpler to use than the simple scripted condition if you don’t have a programming background. Before adding the query to your workflow you can test it by going to Admin → Built-In Scripts → Allows the transition if this query matches a JQL query. Enter the query and a sample issue key. Disclaimer: this wasn’t my idea originally. This script lets you use all the flexibility of a scripting language without having to get your hands too dirty. Enter some code in the condition box. If this evaluates to true the condition passes and the transition is shown, if not it isn’t. You do not need to explicity return true or false…​ the value of the last statement sets the return value (when cast to a Boolean). However feel free to return true or false if you like. There are a number of samples shown, if you click the link the code will be copied into the text box. You can then edit it as desired, or write something completely new. There are plenty of other plugins that provide similar functionality, for instance checking values of fields. However this gives you greater flexibility, e.g. you can check something xor something_else, plus more advanced conditions such as all issues this one depends on are resolved. The conditions are mini groovy scripts. When they are modified, they are automatically compiled and cached. Many of the built-in functions have a condtion option, as it’s not possible in JIRA to only activate a workflow post-function if some other condition is true. You can test conditions before setting them up for real on the Condition Tester admin script. If there is a syntax error it will be shown. Power assertions are a very useful debugging tool. On the questionable line you are having problems with, simply begin it with assert. This tells us that value for this custom field key is actually a LazyLoadedOption, and we should call the getValue() method. It just so happens that the toString() method of Option returns the value, but you can’t compare them as strings. That is, use the spread-dot operator to call the getValue() method on every item, then we check if "AAA" is in that list. In short, if you are having problems use the Condition Tester built-in script and add assert statements. Remove the assert before using as a real condition - the assertion doesn’t return anything as such so your condition will always evaluate to false if you leave the assert in. Does what it says on the tin. The transition won’t be shown unless all sub-tasks are resolved. You can specify any resolution that the sub-tasks must be in or choose a particular one. The Simple Scripted Validator is a simple check for validating issues after they have been changed in a workflow transaction. You can validate that changes to multiple fields are coherent according to your business processes, likewise attachments, issue links, and parent/child relationships. There are many uses for this function, several of them documented in the specific examples section. Note that you can access the fields of the issue before it was changed in this transition using the originalIssue variable, see Technical Stuff for Advanced Users. This allows you to send email(s) after a transition, to support your business processes. The alternative to this is to define a new event type, new velocity templates, and map the event to the templates as documented here. This method is comparitively simpler and more flexible. When setting this up in the workflow you should preview it first, which will let you test the appearance of the email amongst other things. Taking an example. Say you wanted to send a mail to the reporter and the CCB board when an issue with Critical or above priority is created. (A more useful example might be an email requesting approval for a sub-task for instance, or letting the QA team know an issue is ready for test). Edit your workflow, and add a Script Post-function on the transition you want the email to be sent on, then choose Send Custom Email. The $issue.issueType.name $issue.key with priority  has been assigned to you. Now fill in the email subject template. Clicking on the link below will pre-fill an example. Set the email format. If you want to use an HTML template choose HTML. The field marked "To addresses" allows you to enter email addresses, for instance ccb_board@acme.com in this example. In the "Preview Issue Key" enter the key of an existing issue. Note the highlighted text which tells you that the condition evaluated to true, so an email would be fired in this case. You should now test with an issue that doesn’t have one of those priorities and make sure the condition evaluates to false, and for extra points, one where no priority is set at all. Add the Send Custom Email post-function to the ToCCB_Board transition. Finally, having tested that the recipients, the subject and email body look correct, you can add this as a post-function to your workflow. The comment made in this transition, if there was one. If not this will be null, hence you should wrap it an if block as shown in the example template. In previous versions of the plugin this was set to the last comment on the issue, regardless if it was made in this transition or not. This was not the intended behaviour, but if you were relying on it then update your templates to use`mostRecentComment` instead. The comment made in this transition, or if there wasn’t one, the most recent comment made prior to this transition. The latest comment made prior to this transition. Using this, plus lastComment, can display a conversation thread. Unlike the standard JIRA email facility, this function can optionally include issue attachments in the mail. Useful for sending to offsite collaborators, who may not have JIRA accounts. You have the choice of sending none, all, new (added this transition), or you can define a custom callback for complete control over what attachments to include. There are inline examples for this. This built-in script provides an alternative method for sending emails under certain conditions. Provide the name of the event to be fired, and the condition under which to fire it (see above). This method lets you use the "power" of velocity templates, but you will need to create a new event type, and associate it with your templates. This function is useful if you only want to send mails to your Project Manager for high-priority issues or something similar. This post-function will automatically transition an issue if the provided condition holds true. Let’s take a contrived example again. Imagine that all new Critical priority issues should go to the CCB for approval when the issue is created. To realise this we add this post-function on the Create Issue transition. It’s not obvious how to get to the properties of the Create Issue transition. Click the first step, then the action will be available in the box at top right. Place this as the last post-function, or at least after the Fire Event function. If you don’t do this, it won’t work. So, if the issue has priority == Critical the issue will automatically have the "Requires CCB Approval" action applied on it. When choosing a workflow action, note that you may see multiple actions of the same name. The key thing is the ID. It must be a valid transition from the target state of this action. You can get the ID by mousing over the links in the transition. You can use this script multiple times on a transition, eg the Create Issue transition, to effect different default start statuses for an issue, depending on some value or other. Clones the current issue to a new one. All system and custom fields are copied from the source issue. You can specify an issue type and/or target project, but if you leave them blank the clonee will have the same project and type as the cloner. Specify also the link type and direction…​ this will normally be Clones, but doesn’t have to be. As of 2.1, outward and inward links are also copied. So if issue A depends on issue B, after cloning to issue C then issue C will also depend on issue B. And similarly if issue B was depended on by issue A. Due to indexing changes in JIRA 5.1, this post-function should be placed immediate after the function: Re-index an issue to keep indexes in sync with the database. If you don’t do this, the parent issue will not be indexed correctly. This is very similar to Clone an Issue above, except that it will create a sub-task. This function could be used multiple times to create several sub-tasks, for instance if you have an issue type that requires approval by 3 groups you might create a sub-task to represent each approval, and use the "Transition parent when all subtasks are resolved" to automatically transition the parent when each sub-task has been approved. Let’s say the information on the parent issue is not complete and Marketing reject their sub-task. Providing the two optional arguments shown are entered, the next time the parent moves through this transition then the issue will be Reopened, as opposed to another instance being created. This is also useful for sub-tasks that represent whether an issue has passed testing in a given environment. This post-function should be placed immediate after the function: Re-index an issue to keep indexes in sync with the database. If you don’t do this, the parent issue will not be indexed correctly. To disable or selectively copy links, use the same method as described above in Clones an issue and links. Put this post-function on the sub-task workflow on transitions where the workflow could be set, typically Resolve Issue. If all sibling sub-tasks are resolved this will transition the parent issue using the provided action, which should be valid for the current step. If it’s not valid, nothing will happen. Using the example above, this is put on the Approve transition of the Approval issue type. When all child Approval records are approved, the parent is automatically transitioned to the Approved status. Because you will often want to resolve the parent, for convenience you can specify the resolution to be used for the parent record, if necessary. I have not experienced this but users have reported problems if this is not after the Fire Event…​ in the list of post-functions. Useful for alerting participants of other issues that a blocker is resolved, etc. Configure the link type (eg "blocks") and the comment to be added to blocked issues. Adding the comment will cause a mail to be sent (according to your notification scheme). Put this function on your Resolve Issue transition. It should probably also be available as a listener, but it isn’t right now. Useful for setting the security level on an issue according to some criteria about the issue or the reporter etc. Better to do it in an automated fashion than risk leaking information. To set this up just specify the condition (multiple sample conditions are provided), and the desired issue security level. These are grouped by issue security level scheme…​ if you are applying this to multiple projects they should all use the same issue security level scheme. If the scheme or level doesn’t exist a message will be logged in your application log file, but other than that the user will not be alerted. It didn’t set the desired security level? This function has two complementary parts - either adding an issue to an active sprint, or removing it from its current sprint. For example, on the Start Progress transition you might apply this function so it’s automatically added to the current sprint. This is not the scrum way, where the entire sprint should be planned in advance, and if you finish early you should just twiddle your thumbs (not really true). However, sometimes you finish all the work in a sprint, and it’s a pain to then have to manually add everything you’ve worked on to the current sprint. In the function configuration you provide a board name, the function will pick the first active sprint from that board. 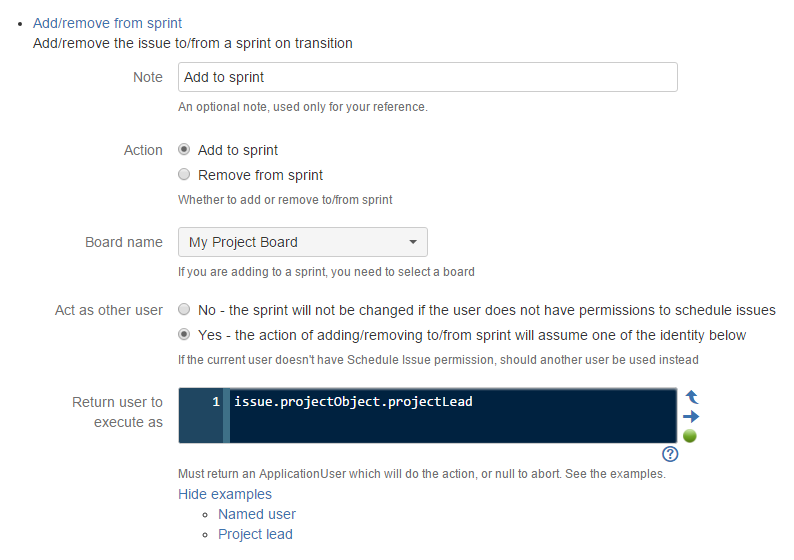 It’s possible that a future version will allow selection of the first unstarted sprint. Changing the sprint requires the user to have the Schedule Issues permissions. There are two options here. If you choose Yes, you need to select a user who the sprint change will be done as. This will appear in the history as though the selected user had added the issue to the sprint. It’s possible to automate use of built-in scripts, i.e. calling them programatically. All scripts take a JSON payload. Currently this is url-encoded…​ which is likely to change in the future. The payload contains the names and values of the parameters, plus the name of the built-in script we want to execute. The easiest way to get these is to execute the Preview function, and copy the scriptParams parameter. As an example, let’s use the script which bulk imports custom field options. We need to post data similar to the following, which will add the three options AAA, BBB and CCC. Do not forget the scriptParams= part. > curl -u admin:admin "http://<jira>/rest/scriptrunner/latest/canned/com.onresolve.scriptrunner.canned.jira.admin.BulkImportCustomFieldValues" -H "X-Atlassian-token: no-check" -H "Content-Type: application/x-www-form-urlencoded; charset=UTF-8" -H "Accept: application/json" --data "@add-opt.json"
In all the examples, enter appropriate administrator credentials. If there is an error running the script, you will get a 500 status code, and a message. > curl -u admin:admin -X POST "http://<jira>/jira/rest/scriptrunner/latest/user/exec/" -H "X-Atlassian-token: no-check" -H "Content-Type: application/x-www-form-urlencoded; charset=UTF-8" -H "Accept: application/json" --data-urlencode "scriptText@script.groovy"
> curl -u admin:admin -X POST "http://<jira>/jira/rest/scriptrunner/latest/user/exec/" -H "X-Atlassian-token: no-check" -H "Content-Type: application/x-www-form-urlencoded; charset=UTF-8" -H "Accept: application/json" --data-urlencode "scriptFile=foo/bar.groovy"
You can add your own built-in scripts, or copy and hack the existing ones. Please review the Upgrading from Previous Versions section in addition to this. Built-in scripts must implement the com.onresolve.scriptrunner.canned.CannedScript interface. You can view this class in the source distro to view the javadoc. If you’re starting from scratch there is a stub class, com.onresolve.jira.groovy.canned.admin.ExampleBuiltinScript, in the source distro which may be a useful point to begin at. For hacking the distributed scripts copy it out to the file system, changing the file name, the class name, and at least get the value returned by the getName() method. Any scripts with the package com.onresolve.scriptrunner.canned.jira and which implement the interface above will be automatically recognised, and reloaded when they change. So the simplest method of development is to have the script open in your IDE or text editor, make changes, then copy it out to one of the Script Roots, then reload the page. Or, you can just edit the built-in script which is in the classpath, and reload the page.